Transdisciplinary discussion: We will facilitate a transdisciplinary discussion among philosophy, economics, science, law, urban planning, cultural studies, and theology. Comparative analysis: Through constructive dialogue, participants will be able to discuss core challenges and achievements, comparing and contrasting the best insights from leaders in South Korea, United States, and China. Paradigm change: We will clarify the features of a new paradigm toward ecological civilization and how this new paradigm relates to specific issues such as climate change, city renovation, aging, economic growth, unemployment, etc. Practical solutions: We will explore important strategies and practical steps that can be taken by universities, local governments, NGOs, and religious communities. The global economy, which exploits the resources of the planet and aggravates the polarization between rich and poor, has brought serious problems of alienating nature and at the same time, the vast majority of inhabitants, including human beings. We all want the radical change, but most of us fear for the change, and even in some cases, we easily think some changes are impossible. We need a grand dream of ecological civilization. There are some fundamental questions we need to ask to ourselves. Why do we need a change toward ecological civilization and how urgent these changes are? What are the economic systems we have had and the economics that has fueled the industrial civilizations for hundreds of years? How have the anthropocentric view and materialism misled the civilization? How should the cosmopolitan cities change? Vision is very important for change. We can progress by sharing our vision. The vision of “Ecological Utopia” has been strong rival against industrial civilization for a long time, and now it is an alternative to declining capitalism. Marxism converts to ecology, while it reflects its own limitation that focuses on ruling nature, increasing production, and alienating most of human beings. In this context, China pursues “Ecological Civilization” and includes this agenda in the Constitution of Communist Party. Korean civic society also tries to connect many grass root movements and sustainable policies under big umbrella. Now, we anticipate to make the world network of ecological civilization. The continental philosophy on which modern world has been based separated the subject from the object. This view of dualism divided the nature as an object and human as a subject. It deprived the mind, value and spirituality from nature. As a result, human spirit, value, and spirituality are also threatened. Ironically it reminds us that human and nature are closely interconnected. We are going to discuss about the new values for ecological civilization. Pantheism out of Whitehead’s philosophy, and Yoko civilization of Japanese tradition inspires our new thinking. Particularly, Pope Francis’ encyclical “Laudto Si’” shows us what is the spiritual leadership and integral worldview. The development of scientific technology and productivity has brought huge freedom and happiness to human beings. However, the issue which we must focus on now is to think about the future. Global capitalism which has reached its limit is struggling to find out the next step. From the vocabularies of the Fourth Industrial Revolution, Artificial Intelligence, Big Data, and so on, we attempt to measure the future, but it is unclear whether it will improve human life or not. Post-human studies have a possibility of evolving into the science of hope by means of exploring the coexistence between human and nature. At the same time, it has a possibility of creating new hierarchy and governance through maximizing the ability of some special human beings. For this reason, science should have a dialogue with religion and philosophy. We can move toward ecological civilization by means of policies and politics. We hope grass root movement and green politics will be activated to change the discourse and governance in regarding for transition. Globalization have adversely paved the way for new ecological politics. Many ecovillages and NGOs around the world are working together. The local governments which are adhere to everyday life than the central government try to execute innovative policies. Civic activists also work for involving the residents with ecological way of life. These movements will change citizens’ sensitivity and reshape the purpose of life. When these forces come together, it generates a political power which can control corporations and capital that are profit-driven, transforming the framework of national and global politics. The population of Seoul, Korea is around 10 million, and the population of Los Angeles County, including 3 million in Los Angeles city, is also around 10 million. The ecological transition of both cities has global visibility. Fortunately, desirable ecological transition is advancing in both cities. Since the inauguration of Mayor Wonsoon Park, Seoul has attained many achievements such as energy saving, social economy, and restoration housing policy. Meanwhile, California, including Los Angeles County, is leading the way in environmental and ecological policies in the US. It focuses on agriculture, tourism, education and culture, thereby maintaining pro-environmental and productive economy. The connection between these two cities brings realistic reorientation as we expect. • Roundtable Discussion: This roundtable discussion will explore plans for the 2018 EcoCiv Korea conference in Seoul, Korea. 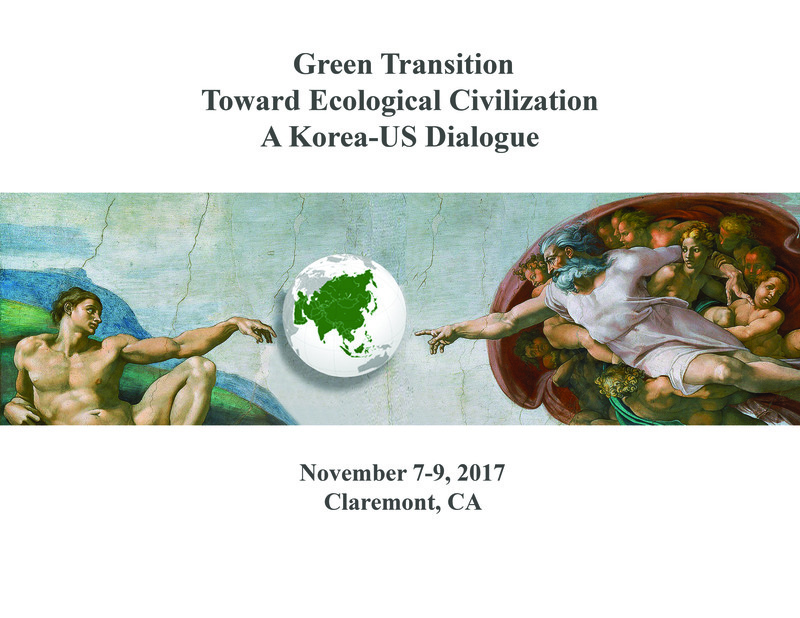 Participants includes representatives from The Center for Process Studies, Toward Ecological Civilization, Pando Populus, Ecological Civilization in Korea, LA City and Los Angeles County, People for Earth Forum, Post-Human Research Team, Seoul Metropolitan City, Green Party of Korea, and Kyunghyang Daily News. The first step toward ecological civilization is the change of consciousness, so the educational change is important and urgent. Most of the universities all over the world aim to make their students competitive and fit for economy. Universities themselves operate on the basis of economic principle. Moreover, each departments are classified and specialized, so the conversation between disciplines are difficult. Even though humanities pursue the integral viewpoint, they are still anthropocentric. We will discuss how to change the university education toward ecological and integral direction. What looks like the ecological civilization in our real world? Arcosanti (ecocity) in the desert of Arizona, which has been built by Italian architecture Paolo Soleri’s design, evolves for fifty years. Pilgrim Place (retirement village) in Claremont shows what means the community of the communities. They help each other and contribute for the bigger community. Maryknoll Sisters practice Pope Francis’ lesson in their everyday lives. These are grass root organizations which enable to realize ecological civilization and give us a lot of hope. Jaedon Lee is Chairman of The Environmental Service Committee in Korean Catholic Seoul Archdiocese, professor of Catholic Graduate School of Life. He is one of the pioneers in environmental movement in Korean Catholic church. His doctoral dissertation of Toronto University was on the study of Thomas Berry’s thought. Kumsil Kang is Advisory lawyer of law partners One, former Minister of Justice Department and former vice president of Lawyers for Democratic Society. After Worked as judge and lawyer, she appointed to the first female Minister of Justice Department in the government of President Moohyun Rho. She founded the People for Earth forum, focused on jurisprudence. Wangjin Seo is President of the Seoul Institute, the think-tank of Seoul Metropolitan City. He received his doctoral degree of environmental policies at University of Delaware, and founded the Institute of Environmental Justice. He also worked as special policy secretary with Mayor of Seoul Metropolitan City, Park Wonsoon. Sangil Kim is Co-director of The Center for Process Studies, director of Han Thought Institute, former philosophy professor of Hanshin University, former chairman of Korea Whitehead Academy. He got his doctoral degree at Claremont Graduate School and wrote more than fifteen books on comparative religion. Kyungmin Lee is Professor of Medical School, Seoul National University. Majoring in neuroscience and artificial intelligence, he is interested in the addiction of computer game. His research field also covers the dialogue between religion and science. Heejong Woo is Dean of College of Veterinary Medicine, Seoul National University. He received Ph. D in Pharmacy in Tokyo University, and taught at Boston University. He is an important specialist in Creutzfeldt Jacob Disease (called mad cow disease). Sungwook Hong is Professor of Program in History and Philosophy of Science, Seoul National University. Former professor of Toronto University. As a leading figure in STS (Science and Technology in Society) studies in Korea, he wrote many articles on debating issues. Kiwon Song is Biochemistry professor of Yonsei University, chairman of Academic Society on Vision of Ecozoic Era in People for Earth forum. She got doctoral degree at Cornell University, and specialized in cell division and differentiation. Chul Chun is Systematic theology professor of Hanshin University, director of The Center for Religion and Science at Hanshin University. He got his doctoral degree at the Heidelberg University in Germany. Jiye Shin is Co-chairman of Seoul Branch, Korean Green Party. She finished her alternative education in Haja workshop school in Seoul, and founded social enterprise Youth Platform. She ran for proportional representation of Green Party in 20 th general election. Yunjeong Han is Research fellow of The Center for Process Studies, former director of culture office of The Kyunghyang Daily News, former board member of The Kwanhun Club. She received Ph. D of Comparative literature at Yonsei University. Dongwoo Lee is Director of the EcoCiv Korea project of the Center for Process Studies, and pastor of Pasadena Presbyterian Church (PCUSA). He got master degree at San Francisco Theological Seminary and completed doctoral coursework at Claremont School of Theology. Jongmok Kim is Editor of Mobile News of The Kyunghyang Daily News. He studied philosophy in Sogang University and worked as reporter of social affairs, politics, and culture office of The Kyunghyang Daily News. John B. Cobb, Jr. is described by historian Gary Dorrien as one of the two most important North American theologians of the twentieth century, Cobb is the preeminent scholar in the field of process philosophy and process theology, and the author of more than fifty books. In 2014, he was elected to the American Academy of Arts and Sciences. He founded The Center for Process Studies at Claremont School of Theology with his colleague scholar David Griffin. David Korten is a co-founder and board chair of YES! Magazine, co-chair of the New Economy Working Group, founder and president of the Living Economies Forum, a member of the Club of Rome, a founding board member emeritus of the Business Alliance for Local Living Economies, a former Associate of the International Forum on Globalization, and a former Harvard Business School professor. Brian Swimme is a professor of evolutionary cosmology at the California Institute of Integral Studies, in San Francisco. Influenced by the work of Thomas Berry, Swimme is well-known for his Emmy-winning film “Journey of the Universe;” and best-selling book of the same name, which draws together scientific discoveries in astronomy, geology and biology, with humanistic insights concerning the nature of the universe. Philip Clayton is Ingraham Professor of Theology at Claremont School of Theology. His specializations are in philosophical theology, interface between science and religion, and the history of modern metaphysics. He won the Templeton Prize for Outstanding Books in Science and Religion. He established non-profit organization Toward Ecological Civilization. Wm. Andrew Schwartz is Executive Director of the Center for Process Studies and Co-Founder and Executive Vice President of EcoCiv. He is a scholar, organizer, and non-profit administrator. Andrew earned his Ph.D. in Philosophy of Religion and Theology at Claremont Graduate University. Recently, his work has been focused on high–impact philosophy and the role of big ideas in the transition toward an ecological civilization. Zhihe Wang is Director of China project of The Center for Process Studies. He is former member of Chinese Academy of Social Science and got Ph. D in Claremont Graduate University. He founded Institute of Postmodern Development in China, which organized international conferences, helped establish more than 30 research institute on Process thought in China. Meijun Fan is former Vice-Chair and Professor of the Philosophy Department at Beijing Normal University, China. She completed doctoral studies at Beijing Normal University, specializing in Chinese traditional aesthetics and aesthetical education. She currently serves as Program Director for the Institute for Postmodern Development of China, and Co-Director of the China Project of the Center for Process Studies in Claremont, CA. Eugene Shirley Founding president and CEO of Pando Populus and a long-time social impact entrepreneur. For twenty-five years, he produced prime-time programming for PBS and thirty countries. He was founding CEO of a text analytics firm. And he is a former Jennings Randilpf Fellow at the U.S. Institute of Peace. Karenna Gore is an attorney, advocate, writer and educator, and serves as Director of the Center for Earth Ethics at Union Theological Seminary. Her past experience includes work in the legal center of Sanctuary for Families, which serves victims of domestic violence and trafficking. Karenna is a graduate of Harvard College, Columbia Law School and Union Theological Seminary. She is the eldest child of Al and Tipper Gore and lives in New York City with her three children. Ken Kitatani is an ordained clergyperson in the Sukyo Mahikari Centers for Spiritual Development and a well known cultural and environmental activist. He currently serves as the Executive Director of the Forum 21 Institute, a public forum for NGO’s at the United Nations particularly concerned with the UN’s Sustainable Development Goals. He also is the USA representative of Women In Need International, and an adviser to the Happiness Alliance that promotes Gross National Happiness (GNH). Sandra Lubarsky is Professor Emeritus of Religious Studies and former Director of the Master of Liberals Studies Program at Northern Arizona University. She earned her Ph.D. in philosophy of religion from Claremont Graduate University and writes and speaks frequently on religious pluralism and tolerance and on the importance of beauty as a value system for the 21st century. Lissa McCullough is independent scholar who teaches philosophy at California State University, Dominguez Hills. She works as a professional academic editor. Her concern is with fundamental coherent thinking and cooperative social-political-interspecies endeavor that empower new potentialities of biophilic good out of the emergency of global catastrophe. Andy Shrader is Director of Environmental Affairs, Water Policy & Sustainability for the 5th District of the City of Los Angeles. He advises Councilmember Paul Koretz on issues related to the environment, climate change, water policy, technology and sustainability, working to ensure the city can meet its present economic, environmental, and sociopolitical needs without compromising the ability of future generations to meet their own needs. Albert Park is Associate Professor of History at Claremont McKenna College, and Co-Principal Investigator for EnviroLab Asia. His areas of expertise includes Design & Architecture, East Asian History & Political Economy, Korean History, Modern Japanese History. His recent publications include Building a Heaven on Earth: Religion, Activism and Protest in Japanese Occupied Korea (2015). Steve Sabicer is Executive Director of Sustainable Claremont, and Founder and Principal of The Sabicer Group. Steve is a strategic communications consultant with more than a decade of experience convincing key audiences to move from awareness to action. Steve’s focus is on building integrated marketing strategy and business development for the healthcare and sustainability industries.